I love a creative challenge, especially when it can be done in a group. That’s one reason we’re so invested in doing sewalongs. There’s something so motivating about taking on a project with other people. I also really enjoy challenges that constrain me in some way. As any designer will tell you, constraints and paramenters are an excellent creative tool, because they force you to make different types of decisions and look at your resources and ideas in new ways. This was the first year I was able to fully commit to Me Made May, and I’m so happy I did. Thanks to the wonderful Zoe for organizing this epic challenge! For my challenge, I chose to wear at least one handmade item every day for the month. I photographed and posted them every day on Instagram. It was much easier than I thought, and even more rewarding. The most difficult part was posing for 31 selfies, which I must admit made me feel like a narcissistic 15-year-old. Here are the top five things I took away from this challenge. 1) Quick and simple projects are vital to a handmade wardrobe. Over the course of 31 days, I found myself mostly wearing the simplest, fastest, and most comfortable garments I’ve made. Perhaps that’s not surprising, but it was fascinating to notice just how often I reached for my Mabels, Monetas, Zinnias, or other really easy to make and easy to wear garments, like the slip dress/camisole I recently drafted for myself. Part of this is likely due to the fact that the weather was quite warm, which makes dressing quite a bit less complicated. But still. I wore my various Mabels seven times! This has led me to recommit to making more quick and fun projects in between the more complicated ones. More knits, more simple clothing, more bags and accessories, more fun. Goal: I plan to make more quick, simple, wearable projects. 2) I love neutrals. Like, a lot. 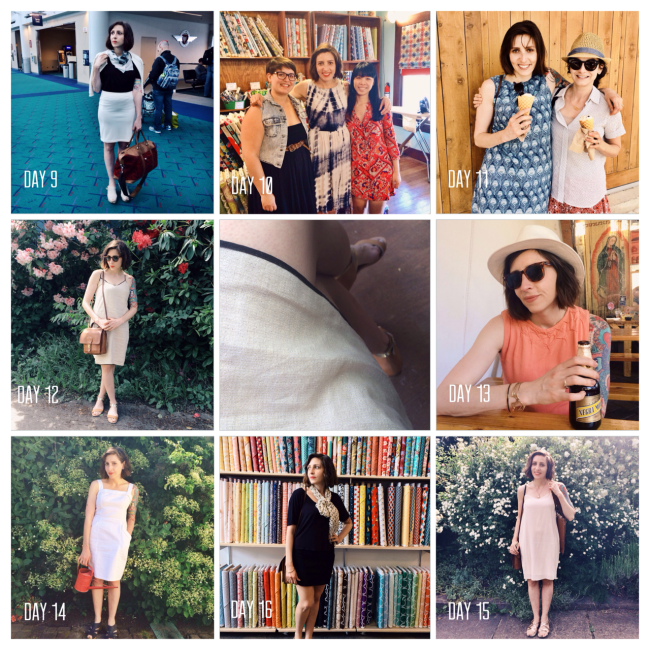 I already knew that I loved neutral colors, but looking back over the photos from the month, I really feel most like myself in classic neutrals like black, navy, white, cream, and camel. Throw in the occasional dash of color, sure, but I really can’t think of anything lovelier than a white dress with bright red lipstick. Goal: More neutrals! I want to make at least one Little White Dress and one Little Black Dress this summer. You get so used to believing that your body is a certain way that seeing yourself through the eyes of others and through photos for an entire month can be quite a jolt. I’ve gone through drastic body changes in the past, and it took quite a long time to come to terms with what I looked like. In the last year, I’ve had a few more subtle body changes. Nothing drastic or all that noticeable, but it’s interesting to realize that they really are there when I look at photos. Not only do bodies change, but what I consider to be flattering on my body changes. Right now, I love shorts, short skirts, drapey things that show off my shoulders, and body suits with full skirts. Many of these are things I hated wearing in the past. Goal: Make at least one more full skirt and body suit this summer. Maybe a Nettie? 4) I don’t need much to love my wardrobe. I really dont feel like I want a lot of clothing. I found that a few simple pieces could be mixed and matched so easily that I easily came up with outfits for the month (with only 1 repeat, I believe). I’d like to replace some pieces I have and don’t wear for various reasons (such as things that don’t fit or are worn out), but I am very comfortable with the amount of clothing I have. Goal: Replace things instead of increasing my wardrobe size by getting rid of something whenever I make something new. 5) Casual comfort wins the day. I like to think about things in terms of cost-per-wear. The cost includes not just the cost of materials, but the amount of time it takes me to make something. The best values here were definitely the versatile, casual, and comfortable pieces. It’s nice to look pretty and put together even when I’m completely dressed for comfort (secret pajamas). In contrast, there were beautiful things I’ve made that I didn’t even have a chance to wear once, because they are just too dressy. They were fun to make and they’re really fun to wear when I get the chance, but mostly they just sit in my closet. Goal: Focus on cost-per-wear, and let fancy party or date dresses be an occasional indulgence. Over all, I feel inspired and ready to do more sewing! I want to make some amazing basics in beautiful fabrics and pretty neutrals. My only hope is that there’s a Self-Stitched September this year! Any sewing goals for 2012? Sarai — thanks so much for this post! As I followed along with Wardrobe Architect, I felt bad about my love of neutrals. Now I don’t! I was also daunted by the narcissistic 15-year-old feeling that came with daily Me Made May photos. I couldn’t do it. You did it with such poise, though. Each photograph subtly different than the previous day’s photo. I couldn’t agree with you more about neutrals and have been on the same mission to make some neutral basics because it is what I feel the most polished and put together in. I have drastically reduced the size of my wardrobe and I have to say that I am loving it, getting ready each morning is a breeze. I think you should start a self-stitched September!! Oh, I think Zoe already has a Self-Stitched September! I really enjoyed seeing all of your Me Made May posts. 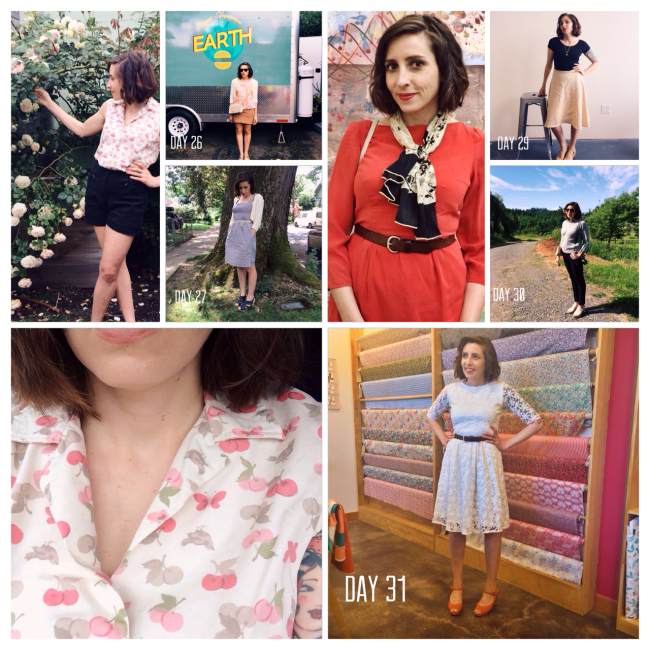 It was very inspiring to see your Wardrobe Challenge come to life! Maybe it’s just because I got to see your lovely face every day but I kept thinking, “Damn, Sarai looks SMOKIN”. Whatever you’re doing, it’s working. I’d love to see you in a Nettie! 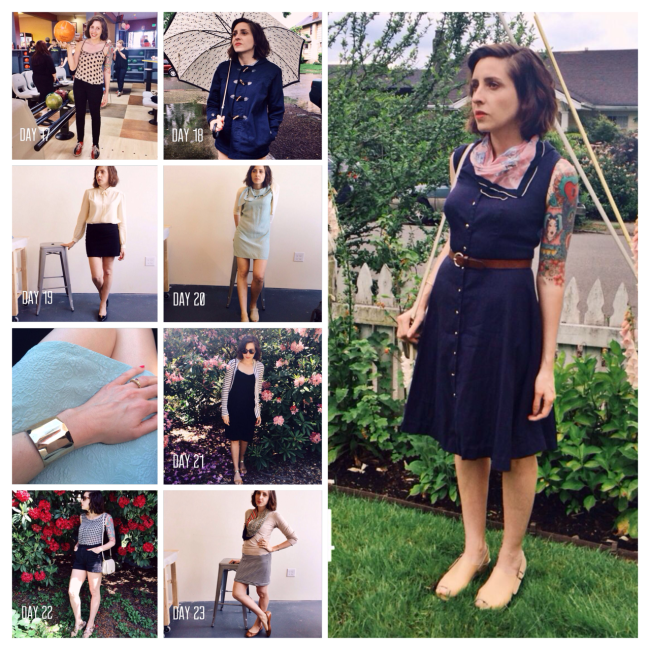 Way way way back when I was first mulling the pattern you did a post about wearing leotards…. and then Maddie did… and then my Nettie did… and I was like, hmm. Something there. So you are indirectly responsible or helping that little seed grow. Couldn’t agree more about making good, wearable basics. I picked up the Mabel a few weeks ago and want to whip up a few for the summer. 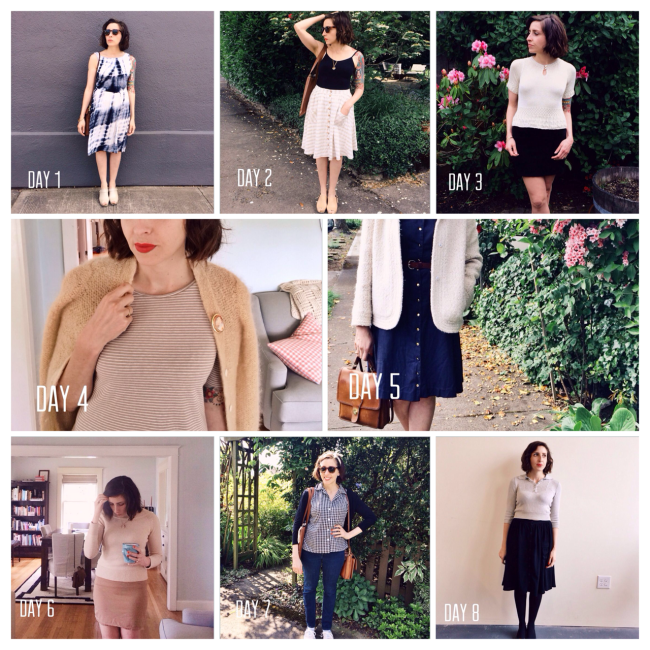 I’ve been on the hunt for a camel double knit – loved seeing yours this month. I have a camel pleated skirt I wear all the time so I think it’s smart to add another to the mix! That’s cool! I definitely love my leos, and the dress version is really similar to a RTW dress I have that I wear a lot in Fall/Winter. But I’d much prefer a handmade version in different colors and fabrics. I’m totally excited about it. I found exactly the same thing: it’s my quickest, most comfortable makes – mostly knits or loose woven tops – that I wear the most! It’s refreshing to realize, because it’s not “wasting time” to do simple patterns or TNTs over again – in fact, it’s a fabulous way to use precious fabrics to make sure that you actually wear them often! I love seeing photos of MMM—please don’t feel weird about all the selfies. You can’t believe how much inspiration these sewing blogs are to me and others! Consider it a public service to those who need a boost in their sewing mojo…I can’t tell you how many times I’ve felt blah, then after looking at your blog, felt like I needed to sew up a storm! Love all the neutrals, BTW. I totally agree! I can understand feeling uncomfortable taking selfies (I sure did during MMM), but then I just reminded myself that if no one posted pictures of themselves for MMM, it wouldn’t really be much fun! I have so enjoyed getting to peek inside other people’s closets and seeing how they style their outfits (I find real-life photos much more inspiring than glossy magazine shots), so I figure it’s only fair to do my part and add mine to the pool too. I think that’s what being a part of the sewing community is all about – we’re all in this together! So true, you guys! I hear a lot of people saying the same thing. They themselves aren’t that comfortable with the selfies, but so enjoy seeing others’ outfits that it overpowers the hesitation. For me, I don’t mind the occasional selfie for showing things I’ve made, but the sheer number of them in one month felt so odd! I really need to embrace your goal from #4- get rid of things when I make something new! I am still holding onto all this old, ill fitting RTW clothing for some reason, even though MMM more than proved to me that what I have been suspecting all along is correct: the only RTW i really wear anymore is jeans and a few cardigans. I need to do a MAJOR closet purge soon! It’s funny, one of the things I realized with the wardrobe architect project was that I’ve gravitated towards sewing challenging, beautiful dresses over the past several years – things like vintage patterns, dresses requiring multiple muslins, fitted within an inch of my life, lined, underlined, difficult fabric, etc. I learn things sewing those dresses, and they’re beautiful, and I’ve worn them. But if I gain or lose any weight, or I want to throw something on for my weekday running-around-with-two littles life, they just don’t work. I realized that early in my sewing career, I’d focused on skirts, relatively easy to sew, often in black or white, that I wore endlessly. And given that I have two littles, I don’t have tons of sewing time now, so my fancy dresses take forever. So my goal this spring and summer has definitely been the #1 on this list – to focus on quick simple projects, the particularly sundresses that I spend the summer in. I love your MMM selfies. I actually followed your Instagram just to see what cute outfits you were going to put together and I wasn’t disappointed. I have so many friends who used to take the most beautiful selfies that showed off their style, be it hair, or how they put together an outfit, or whatever, and they’re too self conscious to post anymore bc they don’t want to be labeled “shallow, narcissistic, &/or attention seeking.” It makes me so sad. I use myself as a model for my drawings and paintings and occasionally post selfies showing the process. The comments are usually positive, but there is a man (and old highschool friend of my husband’s) on my fb feed who always said something along the lines of, “looks like you filled your selfie quota.” So, I started having my husband take my pictures. For a whole week I blew up my feed with photos from my husband & the tag line, “It’s not a selfie bc a man took it. I feel so validated by an outside male source!” That other guy doesn’t make any comments any more. Haha – excellent way to shut down a troll. Good for you! Ha, agree with kc. That’s awesome. I absolutely agree with you on the importance of quick and simple projects, and that many of them should be in your favorite neutrals. These are the pieces that tie a wardrobe together. I love your slip dress! Will it be a pattern? I also have a question about your lace Moneta. Did you use the pattern to line the skirt or did you use an A-line skirt for less bulk? I’m considering making one out of a linen knit which is a bit sheer, so I would need to line the skirt. I just used the pattern to line the skirt. The linning was pretty lightweight, so bulk wasn’t a big issue. I think it worked just fine as-is. Hey! I’m on board with the slip dress pattern _ the one you already have is very cute but it looks very lingerie-ish (and I wouldn’t know how to alter those double spaghetti straps). This one looks more simple and versatile, plus it looks like you used contrasting bias tape (a.k.a. one my sewing guilty pleasures _ I sew those EVERYWHERE)! Through the Wardrobe Architect realistically identifying what I wear to work and to play — I am recognizing that I really like a simple background. This weekend when buying fabric for Mabels — I bought a camel, black and a winter white. Then I picked up an olive cotton twill for a moto-style jacket that I intend to try waxing. All of the fabric folded up looked so calm and serene. I know all of this will match the vast majority of my wardrobe. I finally will be able to have my grown-up Garanimals wardrobe that mixes and matches, is on trend, fits me well and helps me portray the person I want the world to see. I am also affirming that I will make a me-made pledge next year. I did it this year, but did not document. This is how I’ve described Moneta to all my non-sewing friends, when trying to convince them to start sewing. “It’s like wearing a nightgown all day, except everyone sees it as a fashionable dress.” My favorite maxi dress –9 years and counting– is sewn from a 70’s pattern. There is no zipper (pullovers win! ), it was easy, and the fabric is a yummy silk blend. The “throw it on and go” garments turned out to be my favorite in May. I gave up on the selfies because I wore many repeats, but I still felt a sense of accomplishment at the end of the month. My coworkers were also intrigued that a person could wear their own sewing for an ENTIRE month. Two of them are coming over for a Mabel party this weekend! Collette, your posts are not only interesting, but they so heartwarming! You inspire me to keep sewing , regardless of my fitting “challenges”. thanks, so much for that! By the way ,your clothes are beautiful! This was my first Me-Made-May as well and I was so pleased I was able to make my goal of one me-made garment per day. My biggest lesson was: I need to learn to sew pants (other than leggings) because in my day-to-day life as a science teacher, I just don’t reach for skirts and dresses that often. Though I think I need to make a few more Laurels! Thanks for sharing your take-aways! I love, love the photos. I enjoyed the goals and lessons learned too. Very interesting discussion about selfies and social media too. I totally agree with all your conclusions. In fact, I made your Macaron in black ponte with white on top and love it. I also made the Crepe in a black print and even though it’s not neutral, I wear it all the time because of the comfort of it’s adjustable wrap and pockets. Next I want to make the Jasmine in black voile. Love your patterns! I also completely and utterly agree with all three points, especially the third. You have a very defined sense of style that is very flattering to you. Obviously, the wardrobe architect exercises work. This is inspiring. I’m at the point in my sewing to try more of your patterns. Very classy combinations. I aggree with hotter weather it’s best to keep it simple . Thanks again! You’re awesome Sarai! You look absolutely beautiful and happy in all these photos. Your garments are gorgeous and has inspired me to sew more knits. Thank you for these photos! Loved this roundup! it’s nice to see you wear what you design and that those pieces of clothing are so versatile! I have to say though, the primary thing I thought when looking at the pics was your. hair. looks. so. good! Ha, thanks! I’m growing out my bangs, it’s kind of a pain. I love the ideas behind this creative challenge- it is such a neat one! (especially to a girl who is a non-sewer). My favorite part was the insights you got to your own wardrobe, how it influenced you being aware of what additions you wanted in your wardrobe and the idea to keep your wardrobe small.